Our single disabled loo hire is purpose built for wheelchair access, with a wide door for easy entrance. To maximise space internally there is a wall mounted hand sanitiser dispenser, instead of a sink. The additional space also means that a carer, relative or attendant can also enter the disabled loo if necessary. The disabled loo is fitted with two solid handrails and low-level washing facilities for easy reach. Some units can also cater for parents with small children with a pull-down baby changing table. 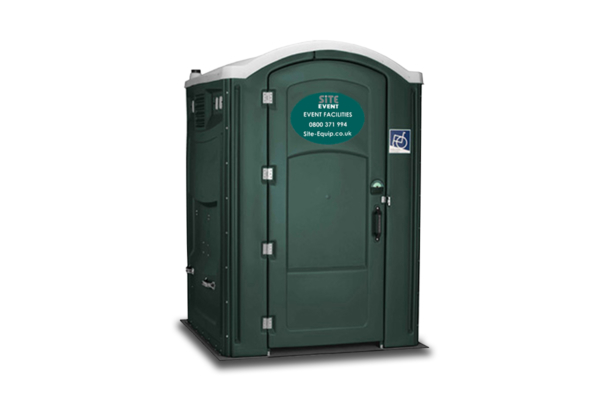 We have multiple loos available for hire to meet the needs of large events. We also have a luxury disabled unit and luxury disabled wet room should your event require more luxury. An additional bonus available on request is the fitted baby change foldable shelf facility. As with all event, non wheeled toilets, the roof is made of translucent plastic, allowing natural light to illuminate the unit, which is certainly enough to see by in daylight hours. Lights can be provided for events held after dark or for those winter months when the sun goes down early. The toilet has a useful hand rail, giving the user the maximum opportunity to manage on their own. Flushing is made as simple as possible by the lever adjacent to the toilet. As with all plastic units, the grade of plastic is of industry standard for maximum stain resistance, also making cleaning easy with our high pressure jet washers. Event organisers have an increasing responsibility to provide ‘easy access’ toilets at public functions and it is therefore well worth considering this when organising and hiring your toilets. Also available is our larger plastic disabled loo. This has significantly more room and can enable the wheel chair user to turn or swing their chair within the area, thereby allowing more independence. This unit has been particularly popular at events run by Riding for the Disabled, where more complex disabilities can necessitate the requirement of additional space. Both units are fully self contained.